"If we continue to keep producing the way we did this past year, we could expect Tobyhanna Army Depot's workload to increase for years to come," said Deputy Commander Frank Zardecki as he praised the workforce for job well done. Team Tobyhanna was able to meet or exceed a number of fiscal year 2018 objectives. The depot surpassed its revenue plan by $8.9 million, avoided the carryover ceiling by $9.6 million, and managed to predict a decrease in rates for next year. Tobyhanna's success has inspired business growth in quite a few ways. For instance, a joint venture to repair components of the Army's multiple integrated laser engagement system lead to the largest Public-to-Private Partnership in depot history. There has been significant increases in the Satellite Transportable Terminal workload; the new Depot Maintenance Forward mission opened its doors to customers in Germany and Korea; and officials noted an increase in Security Force Assistance Brigade missions. With all of this growth, Team Tobyhanna has been developing and increasing the workforce, while modernization of facilities and equipment across the installation remains constant. Employee numbers are increasing thanks to well-attended job fairs and the shrewd use of hiring strategies ahead of an up-tick in workload. Quality of life changes took center stage during fiscal 2018. Modernization efforts included significant renovation of administrative offices, a new café and a new electronics enclosure that offers over 200 state-of-the-art workspaces. 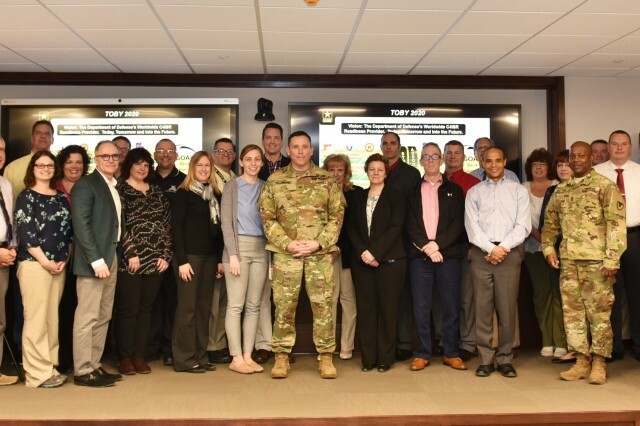 Tobyhanna Army Depot launched Toby 2020 earlier this year to create a sense of awareness, urgency and accountability among the workforce. As part of the strategic initiative officials developed communication tools, including a reimagined command video and mission briefing, and a new and improved social media presence to expand the depots reach. The enhanced communications efforts ultimately resulted in an increase in community engagements and high-level visits, including Armed Forces Week events and partnering with the Pocono Mountain Economic Development Corporation to improve a local railroad bridge. Further analysis of the fiscal 2018 report confirms Tobyhanna Army Depot is an advocate of continuing education, offering a variety of opportunities annually to advance the workforce. The depot's safety, quality and environmental programs ended the year on a high note and senior leaders applauded depot employees using a number of internal recognition programs. Future change will include accountability at leadership and personal levels, as well as more open communications throughout all levels of the organization, according to Tobyhanna's commander. "We need to continue to drive change at all levels," said Col. Nathan Swartz, depot commander. "Tobyhanna has a lot to look forward to with a planned workload of $150 million more than last year." Team Tobyhanna will continue hiring employees to meet requirements of new workload, which will in turn increase operations for both second and third shift operations. Modernization will also continue due to $34 million dollars being awarded for additional improvements across the installation. "In the future, Tobyhanna's metrics can be used to tell us if we're winning or losing. There will be no more in between." Swartz said. "We are not admiring, we are fixing the problems."